I believe this is the third or fourth time we’ve stopped to visit with Lou and Larry in Ohio. We always park in the side driveway, wheels close to the grass, where we can connect to the house power and pick up their wifi signal. Everytime we have visited, they make us dinner and in the evening their daughter comes over with two clever dogs who end up as the center of attention. It has been like this ever since Lou wrote to me out of the blue, as many people do, and invited us to stop in on our way to Jackson Center. Every time we have accepted such an offer, we have made new friends, and many of them have ended up being people we see again and again. For this reason I am already regretting that we won’t be able to accept several invitations to stop in Iowa, Michigan, and Wisconsin. Those are lost opportunities of a very significant sort — friends we won’t be able to make this time through. 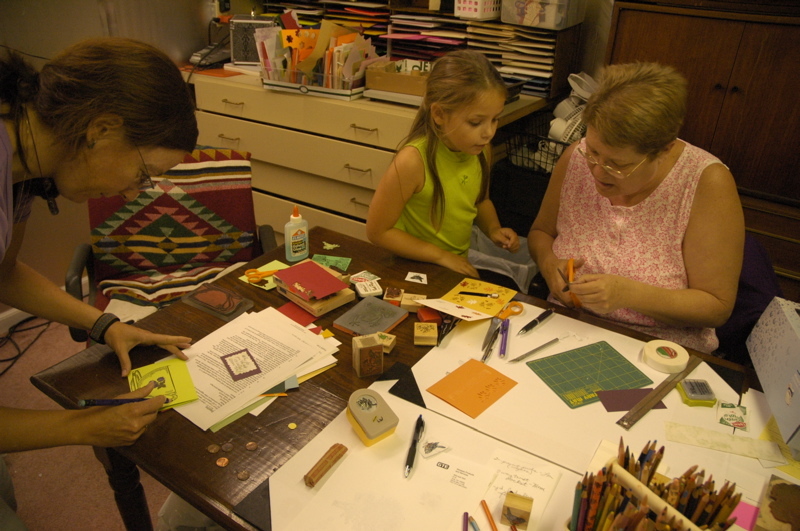 As soon as we arrived today, Emma and Eleanor were immediately enticed into Lou’s basement rubber-stamping headquarters, where they all became absorbed in the task of making some cute greeting cards. 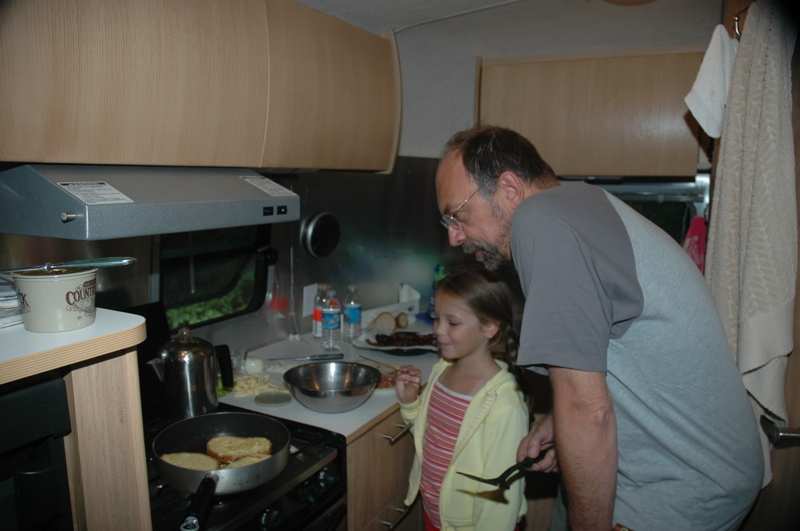 Larry and I were left to go fetch fresh sweet corn for dinner and discuss all types of Airstream-related topics until the cards were, finally, all done and dinner could be served. Another Airstreamer has appeared this evening, too. Dan lives nearby in Ohio and is parked in another driveway (Lou and Larry have access to several driveways on this street). 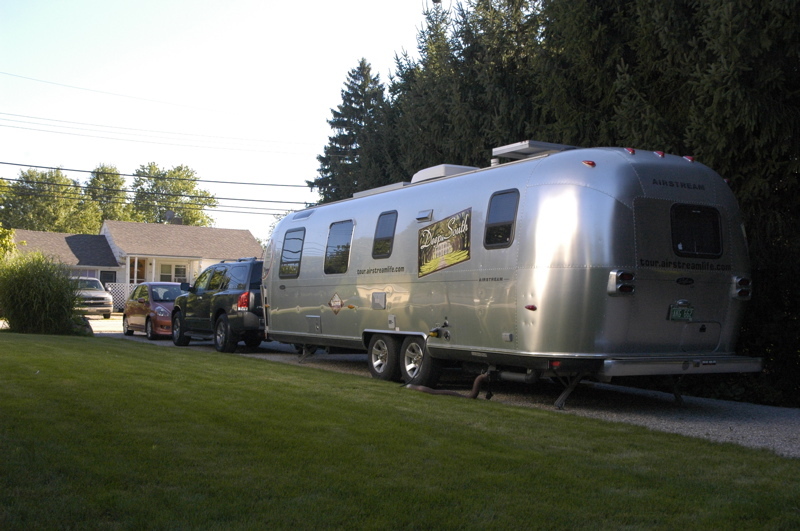 Another Airstream or two will arrive tomorrow, along with about a dozen Airstream owners who are coming without their trailers, for a mini-rally and potluck dinner Saturday night. We’ve never been part of a “driveway rally” before. It should be a great weekend. After a somewhat delayed start this morning, we managed to get our little parade (truck, Airstream, car) on the rural roads of east-central New York again. We make a rather conspicuous caravan, with bright shiny Airstream leading the way and the vivid orange Honda trailing close behind like a whale calf. Woe to those who get in between Eleanor and I on the road — the Airstream is difficult to pass on rural roads, and the Honda Fit is so nimble that Eleanor can trap or intercept any vehicle that dares to separate us. As we were heading north toward the New York State Thruway, we encountered a downhill grade along Rt 28 heading toward Mohawk, with ominous signs warning of the danger. A mandatory pull-out for “cars towing trailers” brought me to a stop and a large billboard that explained the workings of the runaway truck ramp. It was sort of like a pre-flight safety briefing, except without the flight attendant. I’ve never encountered such an elaborate program before, and yet after all that the downhill grade was only about two miles and seemed relatively mild compared to many western grades we’ve traversed. Still, every time I encounter a steep downgrade I shift down and give thanks for the Kodiak disc brake upgrade. I thought traveling as a pair of vehicles would be an enormous pain, but it has actually been very nice and convenient. Eleanor has no trouble staying with me, and with walkie-talkies we are able to stay in touch easily. I have the GPS and lead the way with the Airstream, so navigation is simple and there’s no risk of Eleanor turning somewhere that I can’t with the big rig. The campgrounds have so far been very accommodating about the second vehicle. Tonight’s stop is Letchworth State Park in western NY. There’s a vehicle day-use fee of $6 here, so it does cost us a little more but nobody blinks an eye at our request for a second vehicle pass at the campsite. And for an overnight stop it’s great to leave the trailer hitched up and hop in the Fit for a look around. 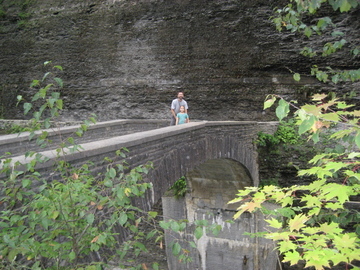 This park is called “The Grand Canyon of the East” for the long deep gorge that runs through the center for about ten miles. Tomorrow it will fill up for the Labor Day weekend, but today it is half empty. 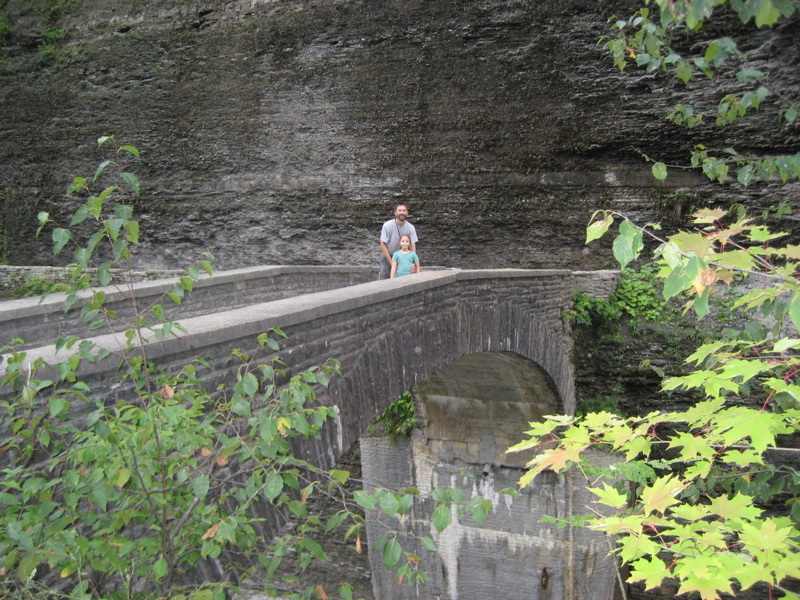 We encountered hardly anyone when we hiked the trail to the Lower Falls, one of three major falls in the park. This park has the look of a great summer destination. 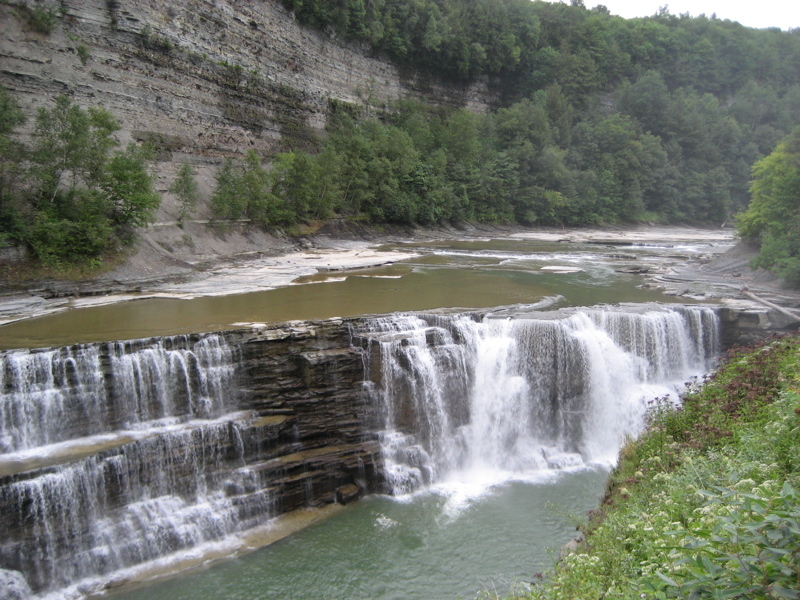 There’s swimming in several spots, plenty of trails to hike, a great campground, scenic overlooks, a restaurant, an historic mansion, visitor center, etc. The weather has been gray and damp this evening, giving the park a muted tone. Outside our screen door insects and frogs are making a musical racket, and while there’s a faint whiff of sweet wood smoke, there are few other signs of neighbors. We may have hit it just right by arriving a day before the big rush. Tomorrow, we will press on to Ohio. Our host arranged for a little tour of the nearby Limestone Mansion Bed & Breakfast inn next door. This very impressive Victorian house looms just outside the back yard of our courtesy parking spot, and I was immediately intrigued by the Italianate style. It reminded me of an 1855 Italianate style Victorian we used to own many years ago. But this house is much bigger and beautifully restored. It’s also obviously made of limestone, chosen specifically because the first house burned down. Since this is the end of the season and only one guest was in residence, we were able to walk through all but one of the fourteen bedrooms, plus the kitchen, pantry, basement, and common areas. It is a spectacular structure, with ornate details everywhere, from marvelous painted ceiling medallions and gumwood railings inside, to quoyne blocks and scalloped slate Mansard roof outside. 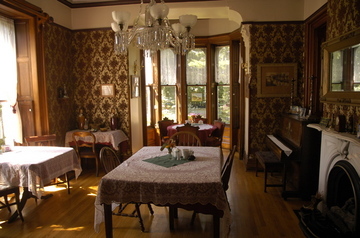 So as fans of Victorian style, every room was fascinating to Eleanor and I. 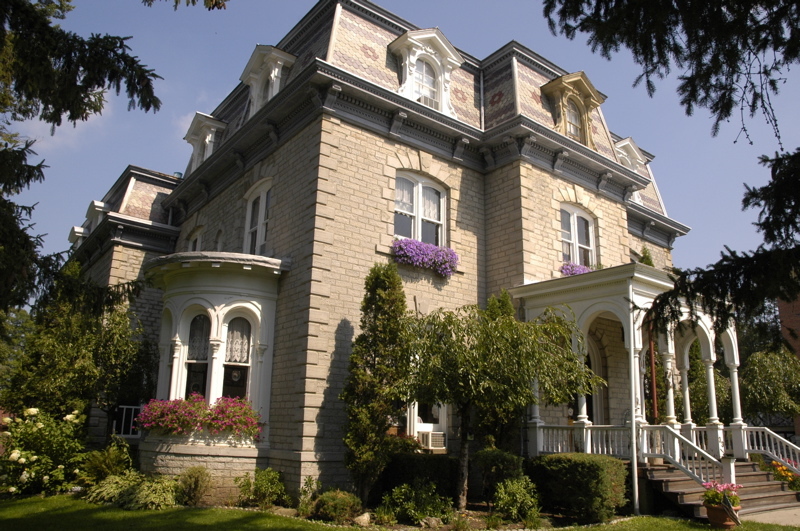 The Limestone Mansion is a relative latecomer to Cherry Valley. Many of the residences in the historic center are from the Colonial era, including the house we are parked beside. The town was lucky to be an important stop on a turnpike from Albany, then fortunate again to be completely bypassed, thus preserving much of the town’s architecture. First the Erie Canal stole traffic away from the Cherry Valley Turnpike, and then the NY Central Railroad did the same, and finally Route 20 and the NY State Thruway (I-90) left Cherry Valley as virtually a time capsule. But unlike so many other New England towns that have been bypassed, Cherry Valley avoided becoming a run-down fragment of itself. Importantly, its architecture and downtown survived, giving it a small-town appeal with an attractive walkable center. 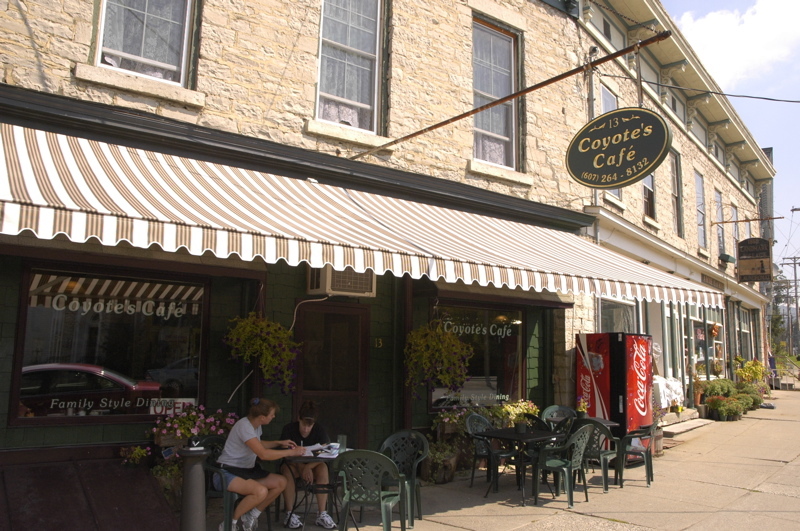 The town is again thriving as a tourist stop and a place for visitors to nearby Cooperstown to find a choice of quiet B&B’s. Students of New Urbanism could take lessons from Cherry Valley. Late this afternoon the UPS truck arrived bearing replacement parts for our hitch. With the help of our host (who really did most of the work), the parts were installed in about 20 minutes, the hitch was re-assembled, and re-greased. We’re ready to go again. 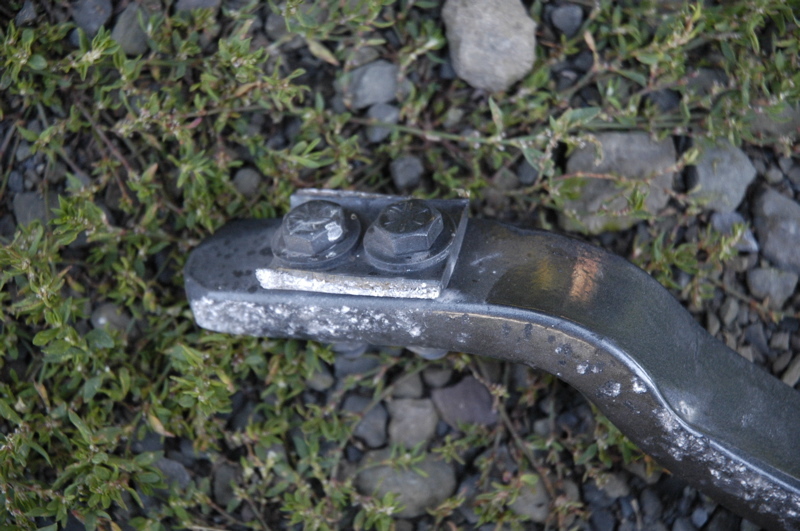 I’ve posted some photos of the broken parts at Airforums if you are interested in the forensic details. By 4:30 I had the grease cleaned off my hands, but it was too late to go anywhere, so we’re spending another lovely night in Cherry Valley. Tomorrow we’ll start heading west in earnest, toward Labor Day weekend with friends in Ohio. The day didn’t turn out as expected, but it turned out better. 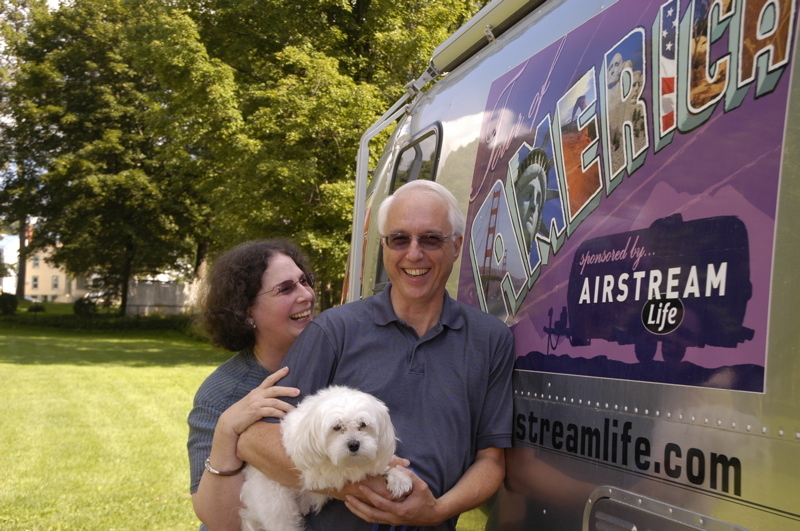 This afternoon blog reader and fellow Airstreamers Bruce and his wife Lena dropped by for a visit, and then Eleanor came back to cook dinner for our hosts and it turned into a party. Eleanor did some serious shopping about fifteen miles from here for this dinner event. I was in charge of grilling and Emma was in charge of food delivery from the Airstream to the poolside cabana. I grilled steak, salmon, portabella mushrooms, onions, and eggplant. Eleanor also made couscous, two different green salads, and a favorite appetizer of fresh fig with goat cheese. Wendy and her parents came bearing wine, along with Wendy’s roommate, the three of us, Bruce and Lena, for a total of nine people at a long table set up poolside. With work and the change in plans, we never did get to roam Cherry Valley. But we’ll try again tomorrow, while waiting for UPS to deliver the hitch part we need. It looks like we may need to stay another night, which would be fine, but we won’t know until tomorrow. It depends on work and when the UPS truck arrives. We have three invitations for courtesy parking tomorrow night, counting here, so we won’t be hurting for a place to stay no matter what. Our tow over from East Berne NY to our current courtesy parking spot in Cherry Valley NY was only about 50 miles. That turned out to be a very good thing, since in the last four or five miles a part of our hitch broke. Eleanor was following the Airstream in the Honda Fit. I heard a noise and felt a lurch, and then she called on the walkie-talkie, “Did you hit that piece of metal in the road?” My response was clueless: “Wow, I didn’t even see a piece of metal in the road” and I went on my merry way. Upon arriving a few minutes later at the home of our hosts, I went to unhitch and found a shocking sight: the right-side weight-distribution bar was completely gone. 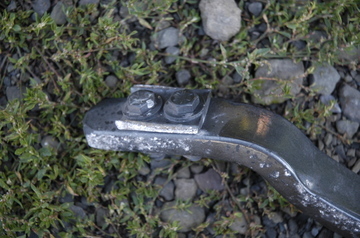 A U-bracket which held it on had apparently snapped from metal fatigue. The sound I had heard, and the metal Eleanor had seen, was our weight distribution bar spinning away on the road surface. We immediately went back to the scene and found the bar still lying in the road, a bit scraped on one side but otherwise in good shape. The bolts that held the bracket were still in place, as was the bottom side of the U-bracket that had failed. 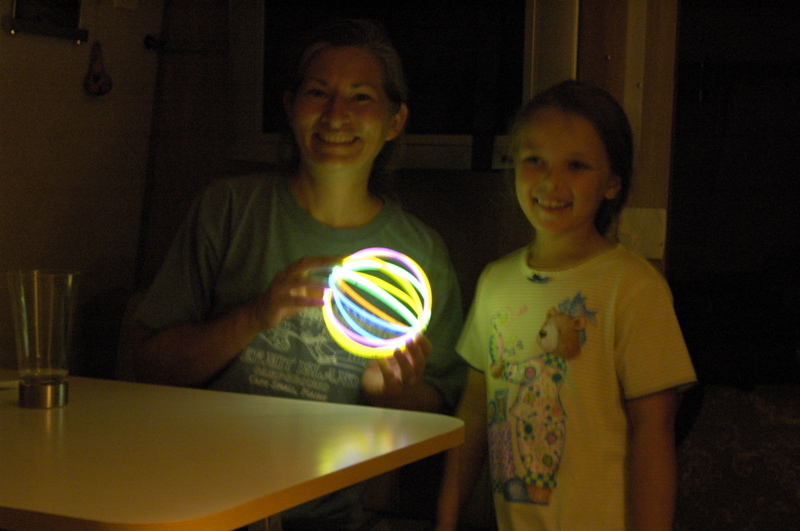 I called David Tidmore at Roger Williams Airstream for advice since he sold us the hitch initially, and then spoke to tech support at Hensley. The broken bracket will be replaced under warranty, but I volunteered to pay for overnight shipment ($33) for a pair of them so we could have it fixed by Wednesday. The tech support guy said that this sort of failure seems to be related to inadequate greasing of the hitch head. Apparently, lack of grease will put extra stress on the bracket, and since the bracket is the weak link, it breaks first. I have lately been scrupulous about greasing our hitch every 500 miles as recommended, but I have to admit I was not as good about it in the first several thousand miles, and so this may have contributed to the problem. 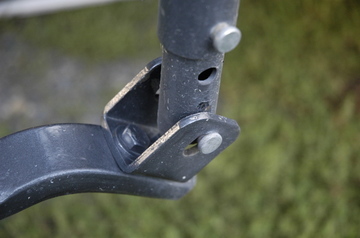 In any case, given the number of miles we put on the trailer, I think replacing both of these brackets annually may become part of our service routine. That should pre-empt any future failures as a result of metal fatigue. We were lucky that the weight distribution bar didn’t do any damage as it exited the hitch. Apparently it slid under the trailer neatly. I slid underneath and inspected carefully, but could not find any visible damage to belly pan, gas lines, tires, or any other component. It could have been a much more expensive problem if that 20 pound steel bar had whacked anything as it went spinning away at 50 MPH. I’ve told Eleanor that if anything else shows up in the road she should let me know. I’ll stop next time to check! The episode shows that the trailer is towable even with one bar missing, which is nice to know. 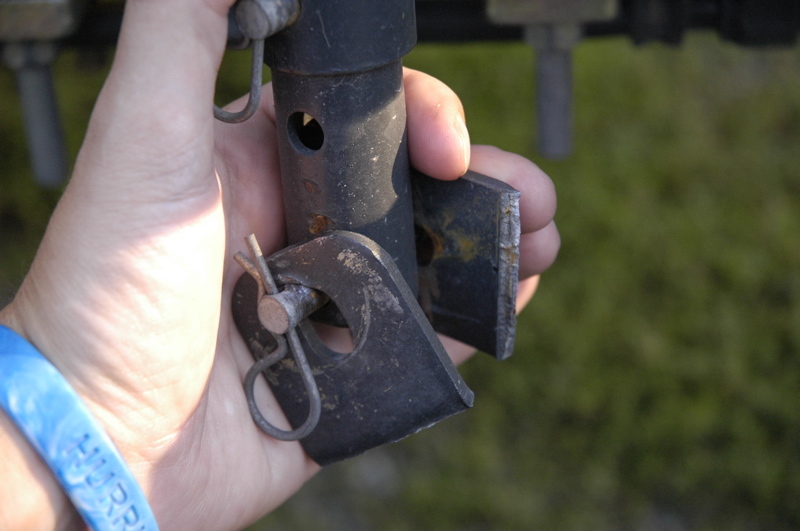 I noticed no change in handling as a result of the loss of one weight distribution bar, although I certainly would not recommend doing this deliberately. With uneven weight distribution the tow vehicle could become dangerously unstable, and so we won’t be going any further until the new part is installed. The way it’s supposed to look! Fortunately, we’re not in a hurry and our courtesy parking spot is really sweet. 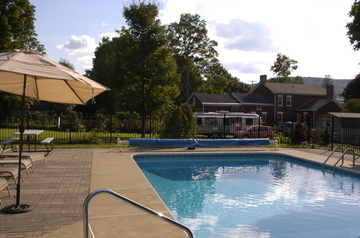 Wendy, a blog reader, set us up at her parent’s house next door in this quiet and cute little central NY town. 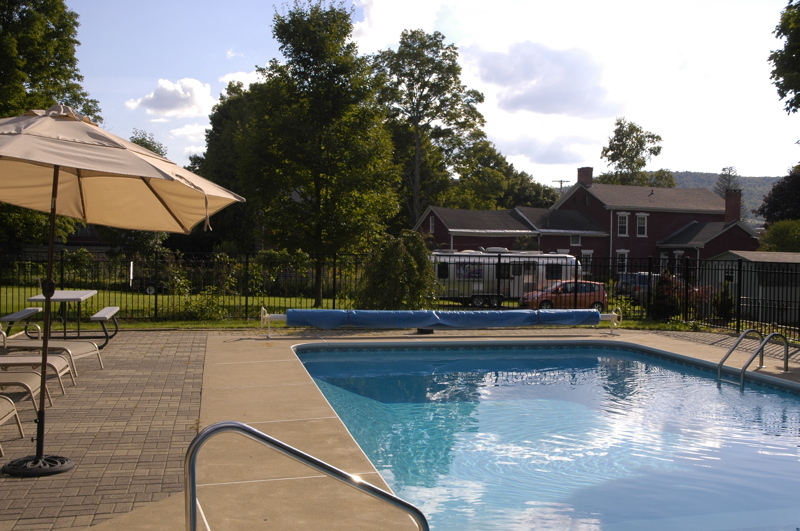 There’s a heated swimming pool, barbecue grill, and cabana available for our use. Wendy’s dad is sharing his wi-fi with me, and the weather is just beautiful. They may have trouble getting rid of us. I’ll blog about the historic downtown of Cherry Valley tomorrow, after we’ve had a chance to explore further. This morning Emma was recruited over to Rick and Sandi’s trailer to help make breakfast. Rick likes to put together a big breakfast on weekends away, and since today was the day to go crawling around in a cold wet cave, he didn’t hold back. After a leisurely breakfast, we headed over to the hamlet of Clarksville to visit the cave. It’s long been informally open to the public but in the past few years the cave has been purchased by the Northeast Cave Conservancy and is now managed. 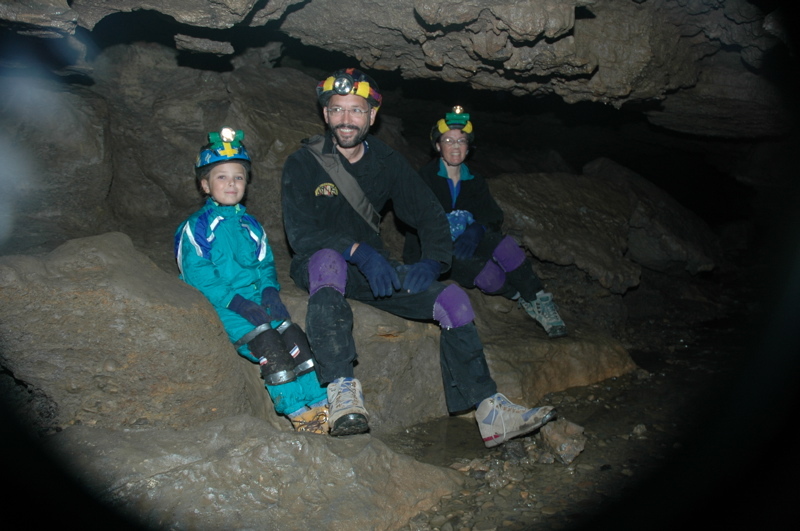 Access is still governed by the loose policy of not identifying the exact cave location. If you want to visit, it’s best to go with someone who knows the place. It’s also good to go with someone who knows the basics about caving in the northeast. Caves here usually run in the mid-40s all the time, and are damp. This cave requires wading through knee-deep and occasionally waist-deep water which is about 55 degrees, and there are numerous low crawls and plenty of mud. So you need to be prepared, with three sources of light per person, clothes that stay warm when wet, kneepads, helmets, a map, snacks, and at least half a brain. Hypothermia, and injuries from falls do kill people in caves who don’t pay attention to safety. 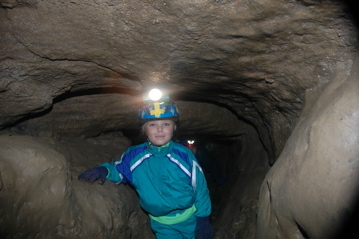 Emma’s first “wild” caving trip was a huge success, for all of us. Emma loved it, even the cold, wet, and muddy parts — which was pretty much all of it. She and Eleanor left through the main entrance after about two hours, but Rick, Sandi, and I continued to explore another arm of the cave for another hour and finally exited through a different entrance. The little state campground we are camped at (not a “state park” for some reason) seems to be dominated by seasonal residents, who have set up little tent cities on their sites. Across the way from us the residents have hung a carved wood sign declaring themselves “The Governor of Thompson Lake”, and our neighbors (not to be outdone) have a similar sign calling themselves “The Mayor of Thompson Lake”. It’s a friendly place where most people seem to know each other, but it also feels more like a residential park because of all the settlement. 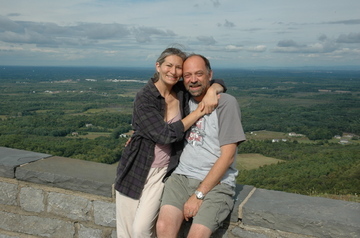 Rick and Sandi hung around into the early evening, but finally had to go back home so they could be at work on Monday. I don’t have to go anywhere but I will also be back at work on Monday, alas, trying to finalize the Winter magazine. We’ve got a few days of courtesy parking planned just a short distance west of here. We have departed Vermont after our two month stay, much to the relief (I think) of many blog readers who were getting tired of me ranting about yogurt and wakeboards to fill the days when we didn’t go anywhere. But believe it or not, most full-timers settle into a place for weeks at a time. It’s fairly typical and even an essential part of full-timing. It’s part of the balancing act that makes this lifestyle work. Not that it was easy to go. Not only did we have to leave family and friends behind, but we had one big task left on Friday: loading the moving truck. Eleanor and I arrived at our storage unit at 10 a.m., but the driver was late and ended up arriving at 4 p.m. Not only that, but the temperature soared well into the upper 80s (a strange occurrence this late in the season in northern Vermont) and the humidity rose too. So it was not a cheery event for us, loading a late truck on a sweaty Friday afternoon when we had many other things to do. But Eleanor and I managed to do the job in about two hours and still get back to the beach by 7:30 to attend a small gathering of friends and family who had come to say goodbye. We picked up the newly-cleaned and detailed Armada at 9:30 and crashed into bed with lists of preparations still to be done first thing in the morning. We are, finally, completely free of the storage units we had in Vermont. That’s a financial and mental relief. (Of course our house in Arizona could be considered a very expensive storage unit since we don’t yet live in it.) Our personal possessions have been culled down to a manageable pile, and should become even fewer after we take another look at them this winter. Now the challenge will be to keep the pile from overtaking us again in the next house. Our first night “on the road” in a while is in a state campground not far from Albany NY. Fellow Airstreamers Rick and Sandi are here as well, to join us tomorrow morning on a caving expedition. Right now thunder is rumbling overhead and there is some rain, but earlier it was a nice — if humid — late summer day. Thompson Lake State Campground has a sandy beach and a roped-off swimming area, where we spent most of the afternoon standing in the water while catching up with Rick and Sandi. Rick made us a hearty stew for dinner and Sandi broke out a toy ball made of glow sticks for after-dinner entertainment. This was a huge hit with Emma. 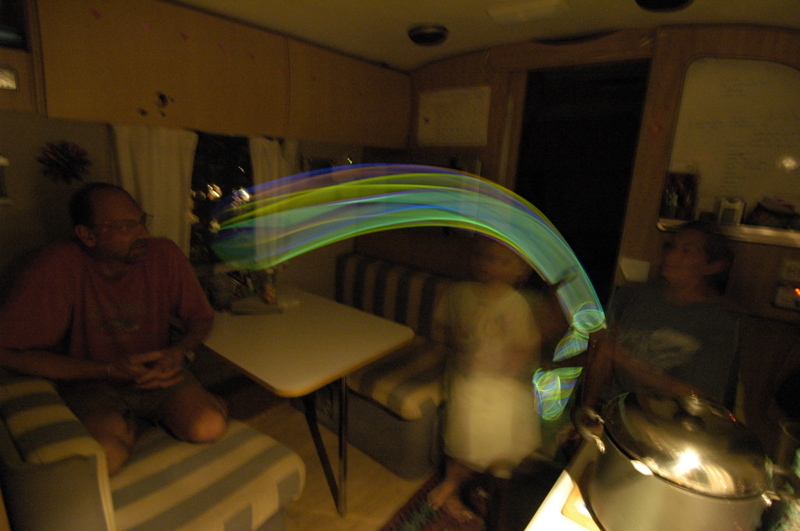 I was playing with a new wide angle lens of Rick’s (Nikkor 12-24 zoom) which is ideal for interior photography of Airstreams, and with a steady hand I managed to capture some time exposures of the ball bouncing around.